What Would You Pay for an Empty Room? A new app allows users to summon empty spaces on demand—but only elites can afford its rates. As a kid, Harold and the Purple Crayon was one of my favorite books. With the utensil of the title, Harold could draw anything in the air and it would come to life: A tree, a skyscraper, even his own bedroom all popped into being from simple outlines. As a New Yorker for most of the past decade, I often think about how nice it would be. Whenever you need a seat, a bathroom, or an extra closet, you just draw it, and it appears. On a recent afternoon I was walking down the Bowery on Manhattan’s Lower East Side feeling like I could use a break and a phone charge. I stopped at a building I had never been in before, got a door code from an app on my phone, took the elevator up to the fifth floor, and walked into an austerely luxurious room with a floor-to-ceiling view of the street that would be mine alone for the next hour and a half. I plugged in my phone, logged onto the wi-fi, and put my feet up on the marble coffee table. This pop-up work lounge appeared courtesy of Breather, a start-up that has raised $25 million in funding to provide on-demand multi-purpose rooms in cities. The company has grown to over 100 spaces in New York alone, launching in Downtown Brooklyn last week. It could be described as Uber for living rooms, or an hourly version of WeWork. But what Breather really does is turn physical space into a frictionless app with the same magic as Harold’s crayon. It doesn’t exist until you want it, and then when you leave, you never have to think about it again. Breather appears almost utopian—occupy only what space you need, and then let someone else have it. Yet it left me with a certain anxiety. Could the future of urban space really be so many empty rooms, taking on an hourly purpose and then transitioning smoothly to the next without a trace of history? If you’re used to the aesthetics of start-up offices and characterless renovated condos, you’re going to feel perfectly at home. CEO Julien Smith and CCO Caterina Rizzi founded Breather in Montreal in 2014. Smith was a writer who collaborated on books with the likes of business guru Seth Godin, and while traveling he found himself struggling to find coffee shops to work in. After some literal back-of-napkin math, he found that it wouldn’t take selling too many hourly rentals to outweigh the costs of a lease. Like WeWork (offices), Common (apartments), and Managed by Q (cleaning), Breather isn’t so much a technology company as a tech gloss on a very old, very conservative business: the temporary meeting-room industry. Incumbents like Regus book days in advance and are designed for big clients who buy add-ons like breakfast catering. “This doesn’t make sense when I just want to charge my phone for 30 minutes,” Smith says. Smith calls what his company does “time-slicing space.” “We’re slicing multiple use cases into the same space, making space more democratic in the city,” he says. 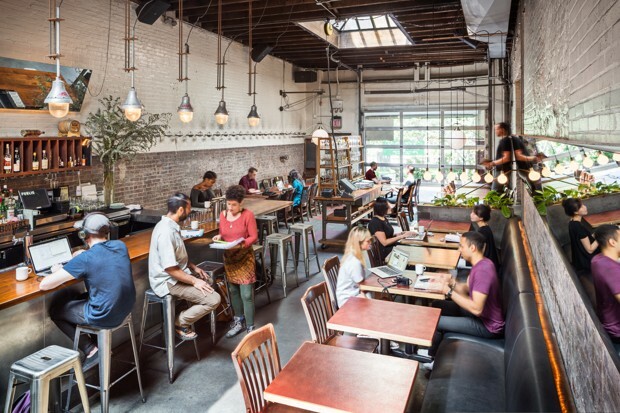 The company identifies a potential spot in places like London, Los Angeles, San Francisco, or Toronto, and takes on a lease (the Bowery space I used just started a five-year lease). Breather’s team of designers redecorates, installing furniture from hip design outlets like Blu Dot, Muuto, and Gus Modern, plus books: TED Talks, architecture monographs. Then it goes live on the app, with prices ranging from $10 an hour for a desk in a shared workspace “Library” to $150 an hour for a 24-person room. Smoking and vaping aren’t allowed, nor is alcohol. There are no security cameras, so there’s nothing to prevent, ahem, romantic rendezvous. Love may find a way, but the skeletal furniture isn’t going to make it any easier, and cleaners arrive promptly, risking an encounter. The app tracks rentals, so there’s little chance of anonymity, and fees will be levied for any “incidents,” as the FAQ warns. One of the selling points is sameness: no matter where you are, a Breather room will look like Breather, with similar design, amenities, and branding. “You can use it in Hong Kong, you can use it in London, you can use it in New York; you’ll always feel this is a safe space,” Smith says. “There’s no risk to turning the knob.” If you’re used to the aesthetics of start-up offices and characterless renovated condos, you’re going to feel perfectly at home. The wi-fi will always be good and you won’t have to sit next to any strangers. It’s yours for an hour. It’s an appealing prospect. The room I occupied was comfortable, though not quite a hotel level of plush, more like a conference room with nice couches. Glitches also showed through: Lamp mountings wiggled, and garbage cans and storage lockers stuck out in awkward spots. The well-kept restroom in the hallway was a bonus. We use Uber instead of the subway, Breather instead of parks. And the less people use public resources, the faster they’ll disappear. Itinerant entrepreneurs, therapists, and even churches use Breathers for meetings. Companies like Red Bull, Uber, and Apple have corporate accounts, allowing them to avoid taking on larger leases themselves. The vision of the company is you can have the space without any long-term commitment or responsibility. “From a macro perspective, people don’t want to own things. That will be truer and truer as time goes on, as technology allows you to have access to stuff when you want it,” Smith says. Breather is part of the coming on-demand world. You will soon be paying for quick “slices” of everything from cars and apartments to office space and even café seating. Smith describes this condition as “more democratic.” While it’s true that getting an Uber requires less money upfront than buying a car, and a Breather less than renting office space, a more efficient distribution of resources is not necessarily any more equitable. Breather creates a marketplace that excludes as many as it serves. The Breather building on Bowery is down the street from the future site of a new 180-room Ace Hotel, which used to be the Salvation Army Chinatown Shelter. The shelter provided temporary space of a far different kind than the startup, for people who could never afford to pay an app for the sake of an hour’s office space or a quick nap on a designer couch. Next door, lines still form for meals at the Bowery Mission, no thanks to Seamless. “On demand” does not mean just anyone can demand it. By relentlessly turning any commodity into a short-term rentable product, these services downplay the role that stable public resources play in our lives. We use Uber instead of the subway, Breather instead of parks. And the less people use public resources, the faster they’ll disappear. At the end of my allotted time (a $120 value that I could never afford), I didn’t want to leave the Breather room. I walked out onto the city street feeling a little calmer and more productive. A similar respite can be found in a coffee shop for $3 or a bar for $7. The fee isn’t even hourly, but it might not come with designer furniture or a phone charger, and you won’t be alone. As is the case with so many startups that continue to promote visions of democracy, how much of the future you have access to depends on how much you can pay for it.